What's the Difference Between a Triphasic Chart and Delayed Ovulation? Most women with ovulatory cycles will experience a biphasic chart pattern during their cycle, in which their basal body temperatures shift from a lower, pre-ovulatory range (typically around 97.0-97.6 degrees F) to a higher, post-ovulatory range (typically between 97.7-98.3 degrees F. The temperature shift occurs right after ovulation, which will usually be around the middle of your cycle. After the temperature shift, your temperatures will usually remain in the higher, post-ovulatory range until you begin your next cycle. An example of a chart with a biphasic temperature pattern. Note the lower, pre-ovulatory temperatures from day 1-11 of this woman’s cycle, followed by the higher, post-ovulatory temperatures from day 12-26. A triphasic chart pattern is when women experience a second Temperature Shift during the luteal phase. The same general Temperature Shift rules apply – i.e., the shift has to be sustained for at least three days above the coverline to confirm that a Temperature Shift has occurred. But in a chart with a triphasic pattern, you will see two clear, sustained temperature shifts – one at the time of ovulation, and another one in the middle of the luteal phase, typically about 7-10 days after ovulation. An example of a chart with a triphasic temperature pattern. It is thought that a triphasic BBT pattern can indicate that a woman is pregnant. This is because progesterone levels will typically rise again about a week after fertilization occurs in order to thicken the uterine lining and prevent other eggs from being released – resulting in a rise in temperature. While a triphasic pattern can indicate pregnancy, some women who are not pregnant also experience triphasic BBT patterns. This may be due to their progesterone levels peaking in the middle of the luteal phase before dropping off again. Also, many women who become pregnant do not experience a triphasic chart pattern, so you don’t need to see a triphasic pattern to confirm pregnancy. A stronger indicator of pregnancy is a luteal phase that is longer than 18 days, with temperatures that are consistently above the (initial) coverline. If ovulation occurs but is delayed, you will see only one clear, sustained temperature shift. It’s possible to experience one or more ‘false peaks’ before the temperature shift occurs, in which your cervical fluid builds up from dry/less fertile to wet/more fertile, and you experience a Peak Day before drying up again, but ovulation does not occur. So, while your cervical fluid pattern may make it appear on your chart as if you ovulated, your temperature pattern will let you know for sure if and when ovulation occurred. 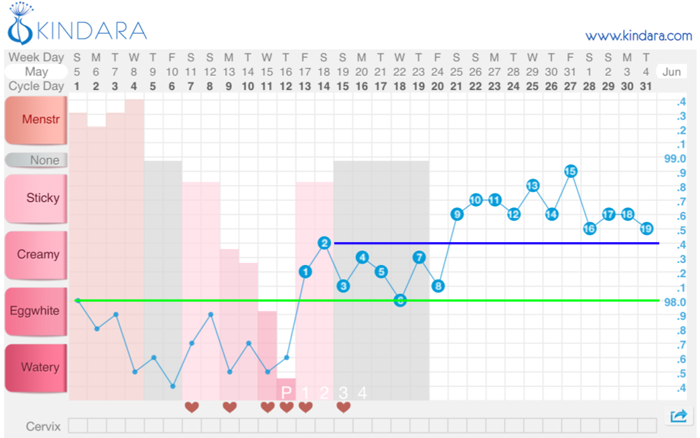 An example of a chart with delayed ovulation. 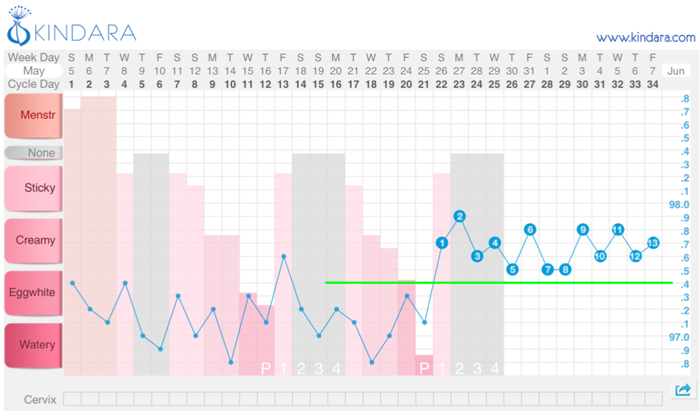 Although this woman experienced a Peak Day followed by a drying pattern on day 12, she did not experience a sustained temperature shift after the Peak Day, indicating that ovulation did not occur. 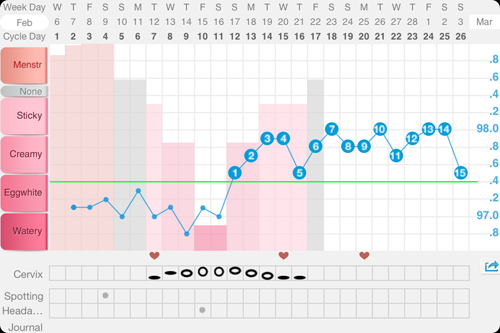 She experienced another Peak Day on day 21 of her cycle, this time followed by a clear, sustained temperature shift, confirming that ovulation occurred.